In 1919, the Turner sisters and their parents are barely scraping by. Their father is a low-paid boot-stitcher in Johnson City, New York, and the family is always one paycheck away from eviction. When their father’s hand is crushed and he can no longer work, their irrepressible mother decides that the vaudeville stage is their best—and only—chance for survival. I absolutely adored this book. 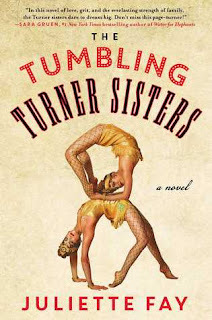 'The Tumbling Turner Sisters' takes place in 1919. Four sisters find themselves working the vaudeville circuit when their father loses his job and the family is in desperate need for money. Told in alternating narratives, we follow 18 year old Gert, a beautiful young woman desperate to escape her hometown and experience life and 17 year old Winnie, an intelligent young woman who dreams of college. The girls and their sisters, along with their manager mother (think Kris Jenner, circa 1919) travel around country performing their acrobat act. Along the way they make friends, fall in love and learn some tough life lessons. I loved this book. The time period is extremely interesting. WWI has just ended, women's suffrage is coming, racial tensions are strained and...vaudeville! I loved the sisters and their relationships with each other. We even meet a young Cary Grant (before he was known was Cary Grant, and yes, he was a vaudeville performer at one point). Yay!! So happy you loved it too.